Christian James, a 2007 member of Spirit from JSU, submitted this photo. 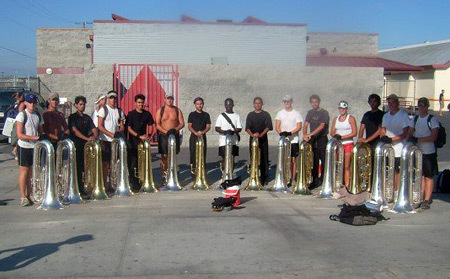 I was a rookie member of Spirit's contra (tuba) line for the 2007 season. This is a picture of the 2007 Spirit and Gold contra lines at Hawthorne High School after our rehearsal for the World Championship Semifinals. The day before, they were gracious enough to take us out to an In-N-Out Burger down from our housing site. We also shared our own stories from the summer with them and showed them our new King horns. On top of marching in a drum corps, that day was icing to a great summer.